The Williams FW27 is the first car that was built under the supervision of the team's technical director Sam Michael. This time no special nose like on the FW26 with its tusks, but rather a regular nose cone as on the FW26B that ran at the end of 2004. The car also represents a return to the single keel front suspension and thereby forgets about all innovative things that the FW26 came up with a year earlier. In race conditions however it appeared that this car did perform even less than its predecessor. Williams struggled with its handling as they did not adopt as well to new aerodynamical regulations as other teams did. The best performance was a 2nd and 3rd place in Monaco thanks to tyre problems with both Renaults there. 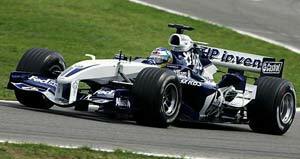 This Williams is also the last in an era to drive with BMW engines as the German manufacturer bought the Sauber team to go ahead on its own in 2006. Williams' FW28 will be powered by a Cosworth V8. 1.3 terabytes of aero data processed in CFD (1 terabyte is a thousand million bytes, equivalent to 69,333 volumes of the Encyclopedia Britannica. 250,000 man hours of design time has been spent on the FW27, with a further 250,000 man hours required in fabrication and build. 4,500 drawings have been produced in the design of the FW27 chassis. End-on-end, these drawings would stretch for 5.350km with a further 4 km expected to be produced to support the FW27’s lifecycle. By the end of the season, drawings would reach from London to Buenos Aires. The FW27 will accelerate from standing to 200kmh in five seconds, and deceleration forces on board will reach 5g. 1g equates to driving into a brick wall at 30km/h. Brake temperatures to generate the deceleration will reach 600 ºC in one second On board the FW27, exhaust temperatures reach 950 ºC and even the air temperature in the pneumatic valve system reaches temperatures two and half times boiling point at 250 ºC. The BMW P84/5 contains 5,000 individual components, and takes 100 man hours to build. BMW have historically produced approximately 200 engines per season, but this figure will reduce in 2005. BMW produce 1,000 drawings in the design of each engine. The BMW engine weighs less than 90 kilograms. At 19,000 rpm, 316.7 revolutions and 1,583.3 ignitions take place each second in the BMW F1 engine. 9,500 engine speed measurements are made, the pistons cover a distance of 25 metres, and 550 litres of air are drawn in. In the P84, maximum piston acceleration was 10,000g. Peak piston speed was 40 metres per second.